A Diver's watch for someone who can't dive, nor swim. I wanted a companion, one that I can bring to the beach, I can bath with, and not worry about being in the water or getting wet. She used to be my Citizen Eco-drive 200m diver's, and I wanted a replacement so I made a bid at eBay for an automatic Citizen diver's watch which fortunately for me, I lost. The reason being, it's no longer guaranteed to go underwater not even in a bathtub. While she looked really nice, it's going to be one hell of a ride for her should she get wet. The loss prompted me to go on a mission, wherein the goal is to get a diver's watch. I'm willing to spend a bit more this time, but not so much, not yet as my heart still beats Chrono. So I went to Hour Glass at MegaMall and looked at options. I remember that Shiela was offering me an Orient diver's and I asked if it was still there, and Shiela confirmed. At Hour Glass, I promptly asked for the Orient-al diver's, and while she was being cuddled by Pao (who was endorsed by Shiela as she's about to eat), I went on to check out the other girls in the aquariums. I checked the Seiko options, the 7S2 something, but for whatever inexplicable reasons, I didn't like the crown at off 4 o'clock position. 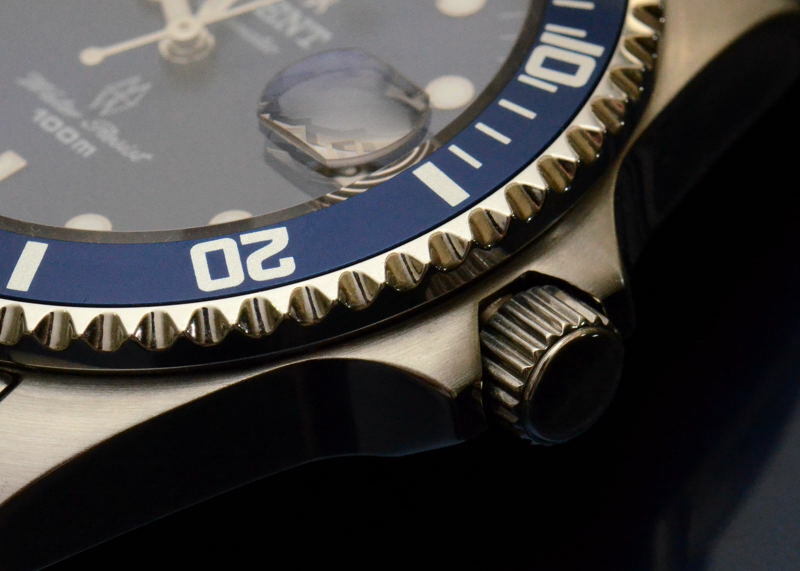 I went to the other side and checked out the offerings from Oris, and while their Diver's watches do have some really nice blue dials, the body and the lugs don't sing to me. The price of the Oris is very affordable, but the combination just don't pull me into her. 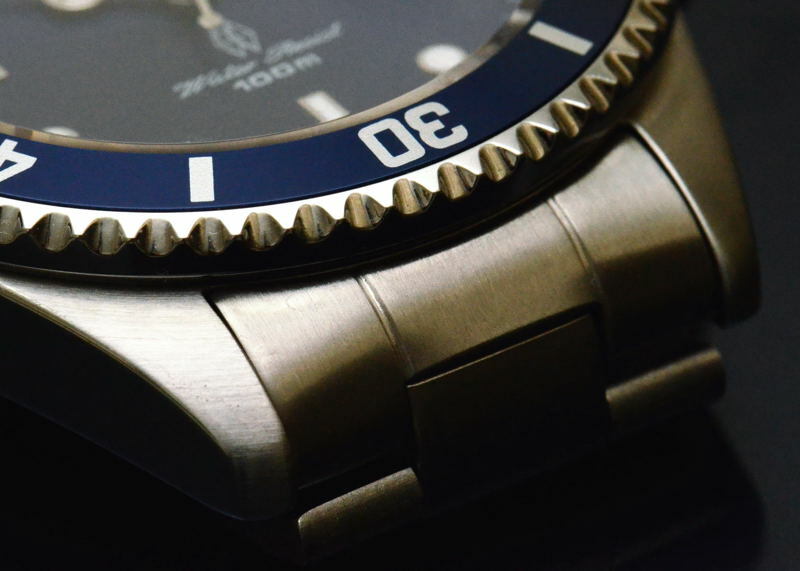 Over to the Tag Heuer section, I looked at some AquaTimers, but then again nothing grabbed my attention. 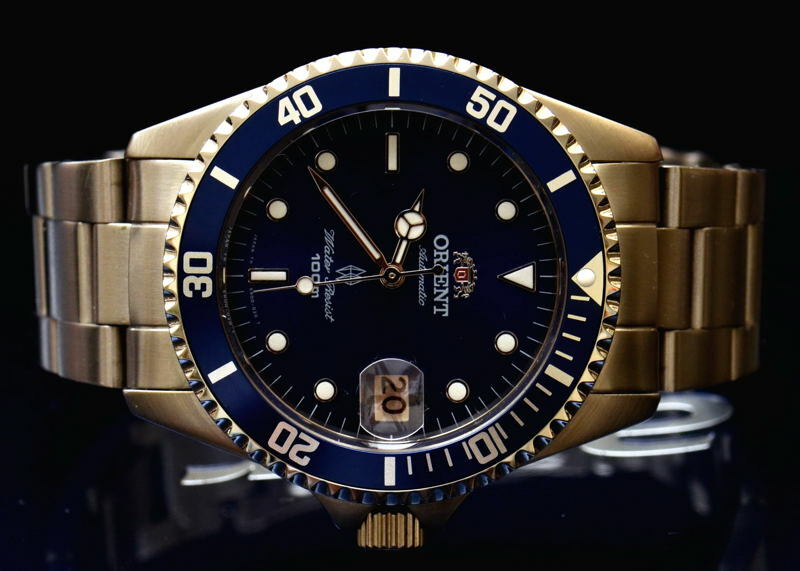 Let me digress for a while, after I picked up the watch from Hour Glass, I went to Chronos and looked at other diver's from other brands but none gets my interest, until I got to the Omega section. Here I immediately got mesmerized with the Seamaster ST2220.80. The nice and accomodating Chronos girls told me there's a promo, where I can use my card and get 6 months, no interest on top of the 20% discount offer. Very tempting indeed! Angelica was so nice to hand me a card with the price information, as well as watch reference, on their generic business card. I feel the urge, but I held back and decided this is going to be a project soon to materialize. Now back to the topic, I tried the other Orientals, the Swiss and American, but in the end, the simplicity from the Orient was my choice. I like the barrel-shaped body just like my Speedmasters, the dog-legged lugs makes it easy to try other bikinis. This are two reasons why I can't get a grip with the Oris, her body and lugs aren't to my liking. In the end, I went for the Orient which for the meantime, will fill the feeling of loss for not winning the Citizen. I like the blue and steel combination. The body has both brushed and polished finish, just like most of the watch I prefer. The top part is brushed, and the rest of the body is polished. 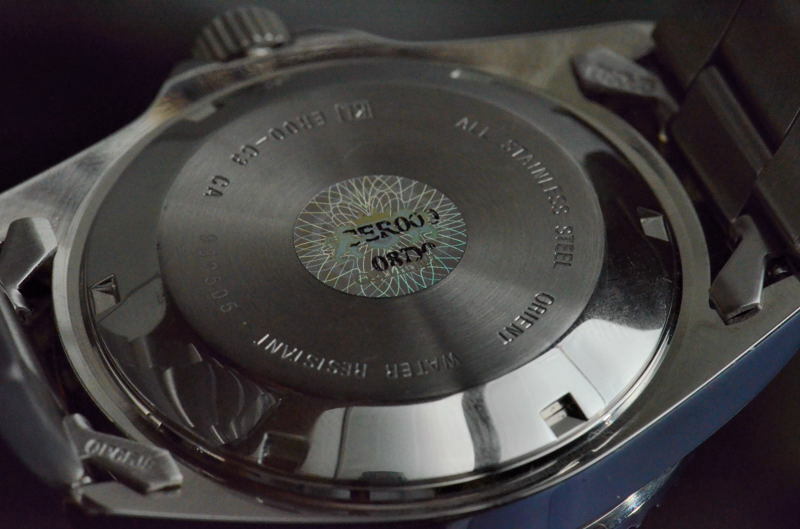 The uni-directional (counter-clockwise) bezel is articulated with some gear-like grooves, and the bezel insert is adorned with simple markings. The glass is Sapphire that is flat, with an aperture at the 3 o'clock position on top of the date window. The un-signed crown is of the screw-down type, and is not flushed with the crown guard as half of it protrudes. The caseback doesn't offer much, no fancy design, very plain. 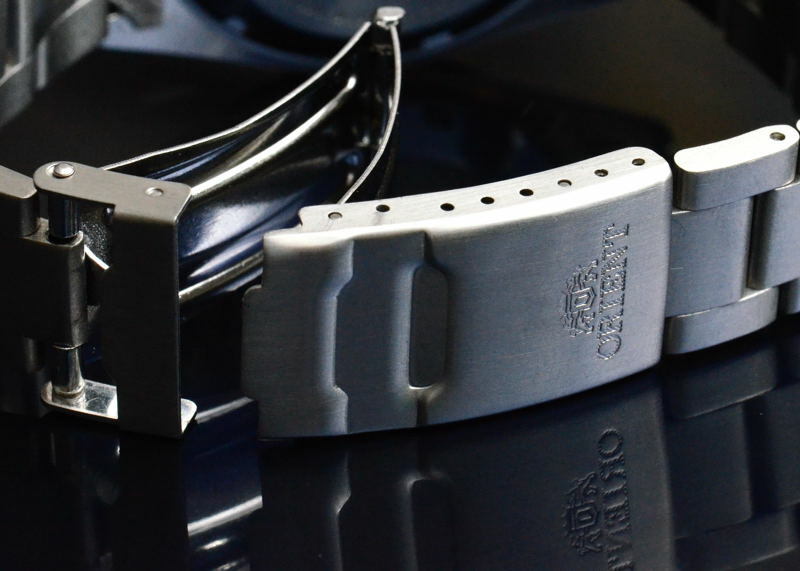 The bracelet also sports a brushed finish, and the folding clasp features a safety lock like my Orient X STi Limited Edition II. While the bracelet looks ordinary, it's not bad either. I can definitely live with it. The CER00008D feels solid, and weighty. The quality and workmanship is very good considering the price of the watch. Riding on my wrist, she feels good and instantly becomes part of me.